Fourth version (!) of the lighthouse environment concept for HL2 Mod Dear Esther. I wanted to spend some more time on this because it has been chosen to be exhibited as part of the upcoming IndieCade Festival in Culver City, LA. I played this game recently, truly beautiful. just played the remake, and is in beautiful. never had the chance to play the original mod unfortunatly. Rob Briscoe has really done a wonderful job, i spent hours just looking around and soaking up the atmosphere. This is just lovely. 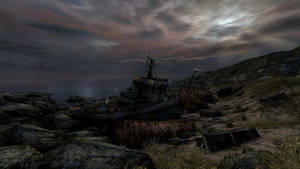 The Dear Esther game itself is so rich with beautiful, bleak, murky atmosphere and you've really put that on display in this image. Terrific colors and shapes - at once real and dreamlike, and I like how I'm drawn from the rotting boat up, across the image and up into the lighthouse and beyond out into the indistinct, ghostly highlands.